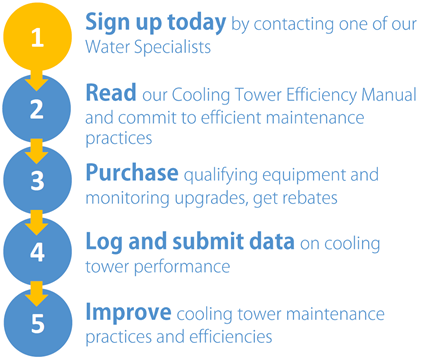 Level Controller News » Cooling Tower Utility Rebate Program. Cooling Tower Utility Rebate Program. Waterline Controls® is actively working to help set up rebate / incentive programs to help save water, and therefore money and natural resources. By helping local businesses set up accurate water level control systems less water is wasted and utility cost go down. By partnering with local utility services everyone benefits. Along with equipment rebates on needed test and control systems, included education and support allow this to work well with little complications or fuss. Rebates for Waterline Controllers are now available from a new water conservation assistance program offered by the Seattle Public Utilities. 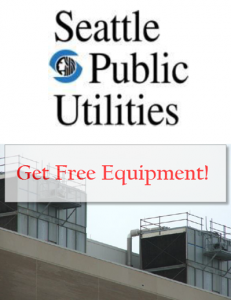 We are proud to announce our partnership with this new incentive program in Seattle Washington, through Seattle Public Utilities, supported by local area WaterLine Controls® distributor FluidTEK. This program is intended to help local Seattle businesses reduce water usage with help, education, support and rebates. Improving the monitoring and therefore reducing current water usage is a proven benefit of our Waterline systems, both economically and environmentally. A Cooling Tower Efficiency Manual has been produced by the utility that outlines the best ways for local businesses to use and save water. All participating businesses are asked to commit to the efficiency practices discussed. Up to $7500 in total rebates are available per business. These rebates are for the monitoring and control systems required to record and control water usage. Even without the rebates, the idea is sound and proven; waste less and save. With our Electronic Sensors and Software driven Modular Solid State (of the art) Controllers, we are the perfect option to participate in this program. Our advanced and fully automated control system was used as the basis for the program’s evaluation process. With local Seattle HVAC parts and service supplier FluidTEK offering local support, you can’t lose. Support is also directly offed through the knowledgeable staff at SPU. To sign up for this program, contact one of the water specialists at the SPU by calling (206) 343-8505. If you are located in another part of country and want more information about Waterline Controls features, functions or its reliability, or would like to help make a program like this possible in your area, please contact Waterline Controls for assistance.